Jaypaw awoke in the overstuffed apprentices’ den. She hardly had room to stretch her legs. Muttering, she pushed herself to her feet and dodged Honeypaw’s leg. She then padded to the entrance of the den. The sunlight warmed her short gray fur, and she finally had more room. Copperclaw was sitting nearby with Jayfrost, and Jaypaw didn’t dare interrupt. She laid down in the sunlight by the fresh-kill pile. From her sunny spot, she could hear small bits of the conversation. “We need more hunting patrols… the badger might come back. We need to be ready.” Jaypaw strained her ears to hear more, but stopped when she realized that she was eavesdropping. Copperclaw stopped talking and headed over to Jaypaw. “Can you go hunting with Jayfrost’s patrol?” Jaypaw leapt to her paws. “Sure, Copperclaw.” Jaypaw was still having trouble learning to hunt, but she had hope. Jaypaw jumped as Kat called to her, flicking her tail in annoyance. She gulped as she realized that the patrol had already left camp. She ran up to join them. They were gathered in a small clearing that was a short way from camp. Jayfrost was sniffing the air, looking around the forest. Jaypaw copied, catching a whiff of mouse to the left of the patrol, further into the forest. “Jayfrost! I smell mouse.” She pointed with her tail. “That way.” The gray-brown she-cat turned around and gave her an approving look. “Then let’s go.” She turned and leapt over a fallen tree, Whorlpelt and Kat following as if they had been aware of Jayfrost’s plan beforehand. Scrambling over the tree, Jaypaw followed the long legged warriors. Jayfrost lead the patrol through a bramble patch that snagged at Jaypaw’s pelt relentlessly, pausing to sniff for prey every now and then. When they arrived in a mossy hollow, she stopped the patrol. “Let’s split up. Jaypaw, you can go after that mouse.” Jaypaw nodded, watching as the others left, one by one, until she was alone on the mouse’s trail. Padding through the ferns, Jaypaw sniffed until she smelled the mouse’s mouthwatering aroma again. She crept closer, peering into bushes and stalking the scent. Soon, she saw the mouse gathering crumbs among some tree branches, completely unaware the Jaypaw was hunting. She almost felt sorry for it. Nevertheless, it was still prey, and she should still catch it. Crouching in her best crouch, she bunched her muscles, and sprang. Yet the mouse felt her paw steps, and ran squeaking to its hole, leaving Jaypaw to sort out her tangled limbs. She hissed in annoyance. Thinking fast, Jaypaw hid in some nearby ferns, not twitching a whisker. Sure enough, once her paw steps were gone, the mouse reemerged from its little hole, finding more crumbs to eat. I’ll get you this time! Jaypaw crouched, and silently made her way forward, leaping squarely on the mouse. A squeal pierced the air, but Jaypaw sunk her claws deep into the prey’s tiny body, silencing it. There was a voice behind Jaypaw. “Well done.” Jaypaw dropped her prey and turned toward the sound. It’s only Whorlpelt. She forced her fur to lie flat. Jaypaw meowed a greeting. She noticed that Whorlpelt was followed by Kat and Jayfrost, dragging a giant squirrel between them. “We caught this together!” Kat panted, letting go for a moment. The patrol came back to camp, and settled down to rest. By now it was sunhigh, and most of the cats were resting. The cats that were awake seemed glad that the patrol had so much fresh-kill. 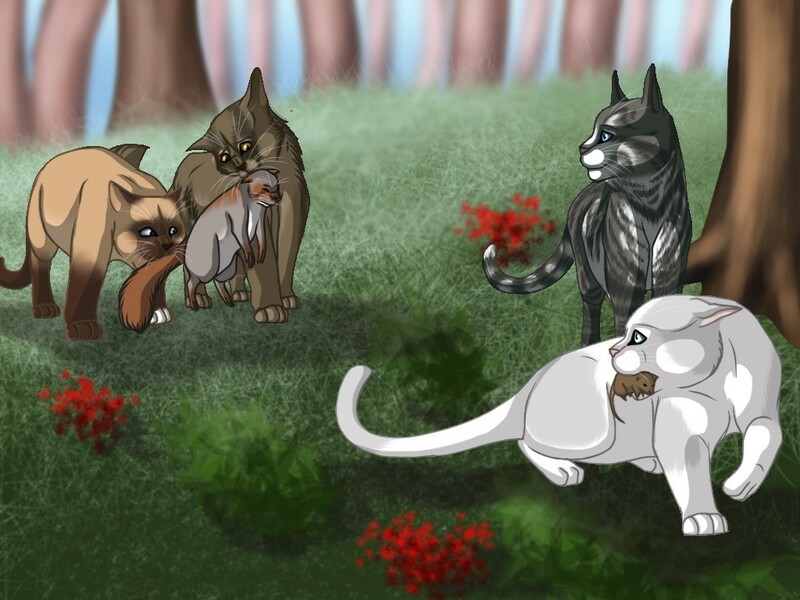 Jaypaw saw Emberpaw, Snakepaw and Inkpaw play fighting, and even Cakestar was out in the sun. She was getting much better by now. Jayfrost and Kat dragged the squirrel to the fresh-kill pile, and Jaypaw followed. Whorlpelt stopped her with one paw. “Take it to the kits.” Jaypaw nodded. Jaypaw padded over to the nursery, dragging her prey with her. Cloverkit and Tigerkit were wrestling outside, and Sorrelkit and Spottedkit were sleeping. “You want something to eat?” She asked Cloverkit. Tigerkit shoved Cloverkit out of the way. “I do!” He called. Jaypaw purred in amusement as the little tom gazed up at her. Tigerkit bounded over to the mouse with Cloverkit right behind him. Jaypaw padded into the nursery, and gently woke the other kits. “You want to eat?” Sorrelkit yawned, getting slowly to her paws. “Okay, Jaypaw.” Spottedkit was soon up as well, and the two kits bounded outside to share the fresh-kill with the others. Jaypaw watched for a moment, listening to her stomach’s growls, before leaving the nursery. She chose a scrawny vole from the fresh-kill pile. She slowly chewed the meat, trying to make it last longer. She gulped it down, and then padded back to the nursery to find the kits playing. “Jaypaw!” Spottedkit called happily. “Can you be a badger?” Jaypaw nodded, arching her back and hissing. Cloverkit laughed and leapt on her back, slipping off without getting a grip. Jaypaw pretended she was about to swing a massive club of a paw down on Tigerkit’s back, but he moved, laughing. Jaypaw circled the kits, still hissing. Sorrelkit gathered all the kits together and whispered something. There was much giggling and whispering. Puzzled, Jaypaw leaned in to hear. What’s she saying? Suddenly, the kits leapt on her, all at once. Jaypaw was so surprised that she didn’t fight back – at first. She took a moment to come to her senses, but started batting at kits that were covering her eyes and grabbing her tail. Soon she and the kits collapsed in a heap of giggling fur. All the kits jumped off of Jaypaw, still giggling. It took Jaypaw a moment to realize that she was giggling too—that only made her laugh even harder. She glanced over at the fresh-kill pile and saw that more cats were up. Playing with the kits had taken longer than she had thought. Bounding over, she found all the warriors gathering around the squirrel, talking loudly and celebrating the catch. A group of about eight warriors hadn’t stopped to celebrate, instead boorishly sharing the catch. Soon the other warriors noticed, and Jaypaw was sure that the kittypets in Twolegplace could hear their shouts. All the warriors gathered around and tried to share, though Jaypaw could see that the squirrel was gone all too soon. Jaypaw settled for sitting down with Flame That Shines Like Sun. “The warriors sure are enjoying Jayfrost and Kat’s catch.” Jaypaw commented to break the silence. “Oh that’s who caught it.” Flame meowed. “No cat knew who it was, because Whorlpelt, Jayfrost, and Kat are all sleeping.” Jaypaw nodded, understanding. She stretched her legs, still feeling battered. “Oh, those kits sure are tough.” Jaypaw muttered. “They got me pretty good.” In response to Flame’s questioning glance, she explained. “I was a badger.” Flame laughed, and the two she-cats turned to watch the warriors. The sun seemed to be sinking in the sky faster than the wind. Soon, it was almost night. The warriors had long since finished the prey, and now Kat and Jayfrost were looking hubristic while being congratulated for the squirrel. Flame had left and gone to sleep, and Jaypaw was shivering in the cool night air. She fluffed up her short pelt, wishing she could be warmer. The warriors decided to sleep soon, and Jaypaw was alone—except for Cherryleaf, who was guarding the camp. The sky was alive and the stars were sparkling. As a Twoleg, Jaypaw was never able to see the stars.—there was too much city light. She breathed in the chilly night air, wishing it would always be like this. Sure the badger had been scary, and hunting was hard, but every down has an up. There was a big up for this down. As the moon rose in the cold night sky, Jaypaw flicked the tip of her tail and padded into the apprentices den. 43 Responses to "Trailing Stars, Chapter 14; by Jaypaw"